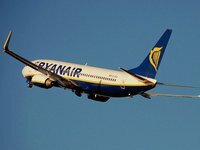 Ireland's low cost airline Ryanair is considering Ukraine as the top three promising countries for development of an IT hub in 2019, Ryanair Chief Commercial Officer David O'Brien said at a press conference in the Infrastructure Ministry of Ukraine on Tuesday. The airline's engineer is visiting several cities of Ukraine, he said. The airline is mulling a possibility of opening the IT center in Ukraine in the future, and when reaching the critical mass for flights we would consider a possibility of opening the plane maintenance facilities in the country, he said. O'Brien said that the negotiations are being held with airports of Odesa, Kherson and Kharkiv. He said that Ryanair is discussing a possibility of launching flights from regional airports of Ukraine, but the issue could be solved in several years. "We will receive 40 or 50 planes in winter 2019 and then we will talk about new cities in Ukraine," he said. Earlier, at a meeting with Ukrainian President Petro Poroshenko, O'Brien said that the result of the previous meeting with the head of state was the introduction of the position of Chief Technology Officer by Ryanair together with the software lab. He expressed hope that the fourth office of this lab will be established in Ukraine. As reported, Ryanair plans to invest $1.5 billion in Ukraine by 2023, expanding the fleet to 15 planes. Ryanair offers flights from Kyiv to six cities in Poland, one destination in Germany, Spain, Lithuania, Slovakia, the U.K. and Sweden, as well as two destinations from Lviv to Germany and Poland, one to the U.K.